Here’s Long Now cofounder Stewart Brand’s summary of Wednesday night’s talk. Start with what the ancient library had—books. The Internet Archive already has three million books digitized. With twenty-nine scanning 29 centers around the world, they’re digitizing a thousand books a day. As for music, when the Internet Archive offers music makers free, unlimited storage of their works forever, and the music poured in. The Archive audio collection has 100,000 concerts so far (including all the Grateful Dead) and a million recordings, with three new bands uploading every day. Moving images. The 150,000 commercial movies ever made are tightly controlled, but 2 million other films are readily available and fascinating—600,000 of them are accessible in the Archive already. In the year 2000, without asking anyone’s permission, the Internet Archive started recording 20 channels of TV all day, every day. When 9/11 happened, they were able to assemble an online archive of TV news coverage from around the world (“TV comes with a point of view!”) and make it available just a month after the event on Oct. 11, 2001. The Web itself. When the Internet Archive began in 1996, there were just 30 million web pages. Now the Wayback Machine copies every page of every website every two months and makes them time-searchable from its six-petabyte database of 150 billion pages. It has 500,000 users a day making 6,000 queries a second. Speaking of institutional longevity, Kahle noted during the Q & A that nonprofits demonstrably live much longer than businesses. It might be it’s because they have softer edges, he surmised, or that they’re free of the grow-or-die demands of commercial competition. Whatever the cause, they are proliferating. 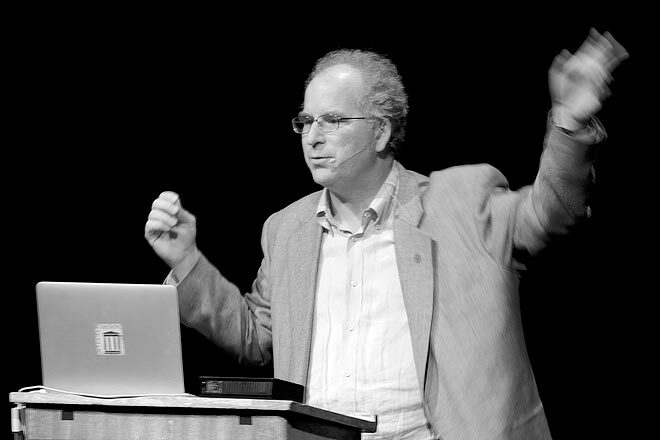 You can delete this but..
who is Brewster Kahle and why didn’t you or Stewart tell me at the beginning of this blog post? I didn’t read the post, no, because I was excluded. Just sayin’.